We have the bright yellow traffic cones in 28 inch height only. Reflective collars are optional and recommended for nighttime use in parking lots. These 7 lb bright yellow traffic cones are an attractive choice for parking lots, valet parking services, special events and attracting attention. If this yellow traffic cone matches your company or team colors, you are in luck. You have now found another eye catching item for your company or team logo. 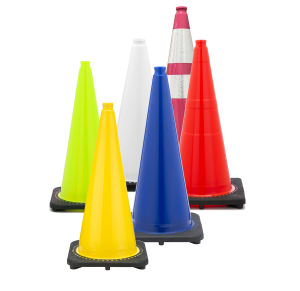 If you are a sports team, just imagine the number of fans on game day that will see these blue cones with your team logo instead of the same old orange traffic cones in your parking lot. Unique bright yellow cones will definitely catch their attention allowing you to brand your image. Optional stenciling or silk screening is available for a small fee.